Father's Day will be especially big for the O'houlahan family this year. A total of eleven brothers and sisters will have the chance to show appreciation for the first time to their new father, Clancy O'houlahan, a civilian worker for the United States Army here on Okinawa. Besides the large number of children in the household, the O'houlahan family is the same as any other American family, with just a few exceptions - all eleven of the children are adopted. O'houlahan began his family in September of 1998 when he adopted Michael, Patrick and Rose. The two boys were in an orphanage in Cambodia and Rose had been in a similar situation in China before they were introduced to O'houlahan by Hawaiian International Child, an adoption agency based in Honolulu. Patrick and Rose are both aged three and Michael will turn two in June. A short time later, O'houlahan decided to extend his love for kids even further by adopting eight more children from Russia through the same agency. His original intention was to only adopt four biological siblings he was notified about, but another handicapped six year old boy, shown on a video tape, captured his heart. He soon found himself applying to adopt five children instead of four. A delay in the adoption process helped to bring O'houlahan's attention to yet another three siblings waiting for a new home. "At first when I saw a video of the three older children, I first thought that I would simply find someone else to take in these kids," explained O'houlahan. "I couldn't find anyone, so I took them in!" In April of this year, the eight Russian children joined Patrick, Rose and Michael. The eight boys and girls, whose names are Sean, Timothy, Colleeen, Maura, Rorry, Danny, Diedra, and Liem, range in age from three to fifteen. Timothy is the youngest and Liem the eldest. Walking into O'houlahan's house is like stepping into a playground. There are kids everywhere, doing everything that kids do - they play, watch TV, and get noisy sometimes. According to O'houlahan though, adjusting to their new home has been relatively smooth. "I was worried bout how Michael, Patrick, and Rose would be accepted by the older kids, but their have been no problems at all." Taking care of eleven kids would be an arduous task for any mother and father, which is what makes this story so incredible; O'houlahan is a single parent. A typical day for him starts at 6 am. A day care worker arrives at 7: 30 am to watch the toddlers during the day, but all the daily routines of family life are taken care of by O'houlahan himself. This includes leaving work at 11 am to pick up his son at kindergarten, returning home to make lunch, and tending to all the kids needs when he gets back home again at 4:30 pm. "There are two times during the day that I make sure we are all together - one is at supper and the other is at 8 pm when we say a prayer together," said O'houlahan. Listening to the magnitude of red tape O'houlahan had to wade through to adopt the eight Russian children is another story in itself. He explained that although his age and marital status did not pose too many obstacles when adopting his first three children, being a fifty year old single male wanting to adopt caused more than a few problems in Russia. O'houlahan even spent two days in a Russian court to plea his case, not to mention all the other background checks that had to be cleared first. O'houlahan is no stranger to caring for those in need. Between 1979 and 1984 he opened up his home in Illinois to over 149 foster children. His home also became a shelter for unwed mothers and refugees. The project finally became to large to handle and was taken over by Catholic Social Services. Not looking a day over forty, O'houlahan's own life reads like a novel. Born and raised in a poor working class neighborhood, he was the third oldest in an Irish catholic family of fifteen kids. He joined the Air Force in 1965 and served his country in Vietnam. After leaving the military in 1971, O'houlahan entered a monastery in Ireland and lived with monks for a year and a half. He recalled the experience and said jokingly, "I was obviously not the monk kind! It just didn't work out." Having seen many places and experiencing many of the things life has to offer, O'houlahan now puts all of his energy into raising his kids. "My only regret is having to leave behind all the other children I became fond of at the orphanage," he said. Despite his kindness and generosity, O'houlahan does not want to be viewed as some type of hero. "In a perfect world I would not adopt, nor would I like someone like me to adopt. I would like to see the kids in a family with both a mother and a father. But, we do not live in a perfect world." He continued by saying, "Nobody should adopt anyone just to be a good guy. In my case, having a large family brings me joy. I would encourage all families to adopt if they feel children will bring joy into their lives." 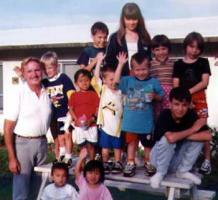 Joy is something easy to find in the O'houlahan family - it shows on the faces of eleven children.